Planning for the presidential transition of Donald Trump, led by then Vice President-elect, former Governor Mike Pence of Indiana, began before Donald Trump won the United States presidential election on November 8, 2016, and became the President-elect. Trump was formally elected by the Electoral College on December 19, 2016. The transition was formerly led by Chris Christie until he and a number of his supporters were replaced or demoted on November 11. The transition ended when Trump was inaugurated at noon EST on January 20, 2017. In accordance with the Pre-Election Presidential Transition Act of 2010, candidate transition teams are provided office space by the General Services Administration (GSA). Transition teams are also eligible for government funding for staff; spending on Mitt Romney's transition team in 2012 was $8.9 million, all funds appropriated by the U.S. government. Under existing federal law and custom, the Republican Party's nominee became eligible to receive classified national security briefings once his/her nomination was formalized at the party's national convention. Key responsibilities of a presidential transition include the identification and vetting of candidates for approximately 4,000 non-civil service positions in the U.S. government whose service is at the pleasure of the president; arranging the occupancy of executive residences including the White House, One Observatory Circle, and Camp David; liaising with the United States Strategic Command for receipt of the Gold Codes; and briefing senior civil service personnel about a new administration's policy priorities. A law enacted by the United States Congress in 2016 amending the Presidential Transition Act requires the incumbent President to establish "transition councils" by June of an election year to facilitate the eventual handover of power. The National Academy of Public Administration (NAPA), meanwhile, launched a new program called "Transition 2016" in 2016. Led by Ed DeSeve and David S. C. Chu, the program was described by NAPA as one which provides management and procedural advice to the leading candidates in establishing transition teams. In April 2016, representatives from the Trump campaign, as well as the campaigns of four other then-running Republican candidates, met in New York with representatives of the Partnership for Public Service to receive a two-day briefing and overview of the transition process. According to Trump campaign manager Corey Lewandowski, the campaign shortly thereafter began implementing the recommendations provided at the meeting. In early May 2016, after Trump became the presumptive nominee, campaign officials announced they would name the members of a presidential transition team within the "upcoming weeks". On May 6, The New York Times reported that Trump had asked Jared Kushner to begin work on putting a transition team together. Corey Lewandowski and Paul Manafort worked with Kushner in the selection of a transition chief. Three days later, Trump announced that New Jersey Governor (and former rival Presidential candidate) Chris Christie had agreed to head the effort. On Friday, June 3, 2016, the Agency Transition Directors Council first assembled at the White House to review transition plans of each of the major executive departments; neither the Trump nor Clinton campaigns sent representatives to this initial meeting. At about the same time, the White House began transferring its preceding eight years of accumulated electronic files to the National Archives and Records Administration's Electronic Record Archive for preservation. The transition planning came under heavy criticism for lagging behind other recent transition planning efforts when it was shown to have hired only a "handful" of staff by late July. At that time, Chris Christie named Bill Palatucci, a corporate attorney from New Jersey and the state's Republican National Committeeman, as general counsel; Palatucci reportedly began meeting with senior members of Mitt Romney's 2012 transition team shortly thereafter. Meanwhile, on July 29, White House chief of staff Denis McDonough led a conference call with Chris Christie to discuss transition procedures. During the call, McDonough informed Christie that Anita Breckenridge and Andrew Mayock will be the administration's primary "points of contact" with the Trump campaign moving forward. The pair also discussed the planned availability of office space at 1717 Pennsylvania Avenue for the Trump transition team, which the General Services Administration was to make available beginning August 2, 2016. During the first week of August, the Trump transition office was officially opened. The same month, William F. Hagerty, a former member of Mitt Romney's transition team, was named director of appointments while John Rader, a senior aide to United States Senate Foreign Relations Committee chair Bob Corker, was retained in the position of deputy director of appointments. In an example of "how removed the transition process is from the tumult and rancor of the campaign", representatives of the Trump and Clinton transition teams began holding a series of meetings with each other, and with White House officials, to plan details of the transition process. By October, it was reported the transition team had grown to more than 100 staff, many of whom were policy experts brought aboard to compensate for a dearth of policy staff employed by the Trump campaign. For example, in October 2016, Robert Smith Walker, former chairman of the House Science Committee, was appointed space policy adviser. A November 9 memo from Ash Carter to the United States armed forces informed them of the pending transfer of military command. In the early hours of November 9, 2016, media outlets reported Trump would secure enough votes in the Electoral College to win the presidential election, and become the 45th president of the United States. Democratic Party nominee Hillary Clinton conceded the election to him later that day. Prior to Trump's return to his private residence at Trump Tower, the United States Secret Service initiated "unbelievable security measures", including closing East 56th Street to all traffic, reinforcing a cordon of sand-laden dump trucks that had been placed around the building the night before to defend the site from being rammed with a car bomb, and deploying New York City Police Department tactical teams around the skyscraper. The FAA, meanwhile, ordered a flight restriction over midtown Manhattan. Following his victory at the election, Trump began transferring control of the Trump Organization to the company's other executives, including his three oldest children; Donald Jr., Ivanka, and Eric Trump in a blind trust. According to a November 11 statement from the Trump Organization, it was "in the process of vetting various structures with the goal of the immediate transfer of management of the Trump Organization and its portfolio of businesses". At a press conference on January 11, 2017, Trump said he and his eldest daughter Ivanka would resign all management roles with The Trump Organization by inauguration day, January 20. Its assets would be put into a trust run by his two oldest sons Donald Jr. and Eric, together with existing Chief Financial Officer Allen Weisselberg. Trump would continue to own the business. At the press conference, Trump attorney Sheri Dillon made a substantial presentation on the legal structure that was being put in place for the Trump Organization during the presidency. "No new foreign deals will be made whatsoever during the duration of President Trump's presidency," Dillon said, and new domestic deals "will go through a vigorous vetting process" and President Trump will have no role in them, among other assertions. Shortly after noon on November 9, outgoing president Barack Obama made a statement from the Rose Garden of the White House, in which he announced that he had spoken, the previous evening, with Trump and formally invited him to the White House the next day, November 10, for discussions to ensure "that there is a successful transition between our presidencies". President Obama said he had instructed his staff to "follow the example" of the George W. Bush administration in 2008, who he said could "not have been more professional or more gracious in making sure we had a smooth transition". The same day, United States Secretary of Defense Ash Carter issued a memo to the United States armed forces informing them of the pending transfer of National Command Authority to a new administration. Also on November 9, the U.S. Intelligence Community offered the full President's Daily Brief to Trump and Mike Pence, with Trump receiving his first brief on November 15 in his office at Trump Tower. By the afternoon of November 9, a transition website – greatagain.gov – had been launched. The website provided information on transition procedures and information for the media. The website was later criticized for reposting content originally created by the Partnership for Public Service, however, Partnership CEO Max Stier declined to criticize the use and noted that the organization had been working with the major campaigns on transition planning, explaining that he hoped the group's materials would be "a resource that is used for the betterment of transitions". Content on the transition website was licensed under a Creative Commons Attribution 4.0 License. 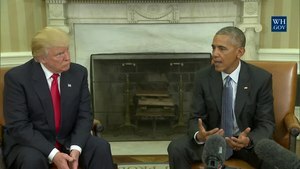 Trump and Obama met for the first time on November 10. At 11:00 am on November 10, the President and President-elect held a private, 90-minute meeting at the White House, which was followed by a joint media availability in the Oval Office with a press pool composed of journalists from Reuters, Voice of America, Bloomberg, the Associated Press, Agence France-Presse, ABC News, and McClatchey syndicate. During the availability, Trump thanked Obama for their meeting and said he looked forward to tapping him for future counsel. According to Trump, Obama convinced him, during their discussion, to retain certain aspects of his signature policy Obamacare, including the ban on insurance companies denying new coverage to those with pre-existing conditions and the right of parents to keep their adult children on their health insurance policies until the age of 25. On November 11, Trump telephoned transition head Chris Christie and told him his involvement with the Bridgegate scandal was a political liability and his performance heading the transition unsatisfactory (Trump, later, also expressed private frustration at Christie's retention of lobbyists in key transition posts). At the end of the call, Trump fired Christie from his position as transition chair. Over the next twenty-four hours, and with little warning, Christie loyalists were quickly removed from the transition team in what was characterized by NBC News as a "Stalinesque purge". Transition executive Richard Bagger, for instance, found himself suddenly locked-out of the transition team's offices. Bill Palatucci, Mike Rogers, and others, were also among those removed. Immediately after the reshuffle, Mike Pence was elevated to transition chair by Trump. Under Christie, many of the members of the transition team were registered lobbyists who had worked on issues overseen by the agencies they were charged with staffing or affected by policies they were preparing. However, by November 16, Pence had introduced new restrictions that Politico described as "in some ways far more rigid than President Barack Obama's groundbreaking lobbyist ban". Under the new rules, while incoming administration officials who are currently registered lobbyists would be allowed, they would have to sign documents forfeiting their ability to re-register as lobbyists for five years after departing government. [a] In addition, Pence ordered that all lobbyists be removed from the transition team, with Politico reporting two days later that staff members who were registered lobbyists had begun to resign. On November 15, Trump requested security clearance for son-in-law Jared Kushner (a member of the transition team), which would allow him to attend the full President's Daily Brief – a request that experts have called "unprecedented". As of November 15, all briefings of the transition team by government were on hold pending the need for incoming chair Mike Pence to sign an agreement with the Obama administration. On November 16, Trump met with Alabama senator Jeff Sessions, who had been discussed as a possible contender for several cabinet positions. Trump also met with New York City Mayor Bill de Blasio. On November 17, Trump met with former Secretary of State Henry Kissinger in order to discuss matters relating to foreign affairs. Later that day, Trump met with Japanese prime minister Shinzo Abe in an informal visit at Trump Tower. After the meeting, which was attended by Michael T. Flynn and Ivanka Trump, Abe said he had "great confidence" in Trump and described their discussion as "very candid". Past and current State Department officials, however, were disturbed by Ivanka's presence. Moira Whelan, a former John Kerry 2004 presidential campaign staffer who left the department in July after serving as a deputy assistant secretary for digital strategy in the U.S. Department of State, averred that "anyone present for such a conversation between two heads of state should, at a minimum, have security clearance, and should also be an expert in Japanese affairs ... meeting of two heads of state [sic][b] is never an informal occurrence. Even a casual mention or a nod of agreement or an assertion left unchallenged can be interpreted in different ways". On December 6, Michael G. Flynn, the son of Michael T. Flynn, was forced out of the transition team. Spokesman Jason Miller did not identify the reason for Flynn's dismissal; however, The New York Times reported that other officials had confirmed it was related to a tweet he made regarding the Pizzagate conspiracy theory. On December 14, Trump met with CEOs and representatives from Silicon Valley tech companies in Trump Tower. National Security, led by former Rep. Mike Rogers, until he was abruptly fired on November 15. Economic Issues, led by David Malpass, the former chief economist at Bear Stearns, and William L. ("Bill") Walton, who heads the private equity firm Rappahannock Ventures and Rush River Entertainment. Walton is Vice President of the Council for National Policy and a Senior Fellow for Discovery Institute's Center on Wealth, Poverty and Morality. Defense, led by Keith Kellogg, the former commanding general of the 82nd Airborne Division. Management and Budget, led by former Attorney General Ed Meese and Kay Coles James. Agency Transformation and Innovation, led by Beth Kaufman. The policy side had three senior leaders including Ado Machida as Director of Policy Implementation, Andrew Bremberg as Executive Legal Action Lead, and Carlos Diaz Rosillo as Executive Authority Adviser. Bremberg is Senior Advisor and Chief of Staff for US Health and Human Services for George W. Bush administration and adviser to Senate Majority Leader Mitch McConnell and for presidential bid of Wisconsin Gov. Scott Walker; he was previously reported to be serving the transition as an advisor on health issues. Defense & National Security, led by Maj. Gen. Bert Mizusawa. Immigration Reform & Building The Wall, led by Danielle Cutrona, counsel to Sen. Jeff Sessions. Energy Independence, led by Michael Catanzaro, an energy lobbyist whose clients include American Fuel and Petrochemical Manufacturers, Hess, Devon Energy, and Encana Oil and Gas. Regulatory Reform, led by Rob Gordon, who serves as staff director/senior policy adviser for the House Natural Resources Committee, Oversight and Investigations Subcommittee. Education, led by Gerard Robinson of the American Enterprise Institute. Healthcare Reform, led by Paula Stannard, former deputy general counsel and acting general counsel of HHS and currently a lawyer at Alston & Bird. Protecting Americans' Constitutional Rights, led by Ken Klukowski, senior counsel and director of strategic affairs for the First Liberty Institute. Persons applying for political appointments via the greatagain.gov website received this confirmation email. Officials from both administrations meeting at the White House on January 13, 2017. Large numbers of foreign policy advisers left the Whitehouse team unwilling to work with Trump's team. The following have been named as cabinet appointees by the President; all positions, except Chief of Staff and Vice President, require the advice and consent of the United States Senate prior to taking office. On November 30, Politico, which viewed Trump's chosen administration nominees as being more conservative as opposed to previous presidential administrations, described Trump as "well on his way to building a conservative dream team that has Republicans cheering and liberals in despair." On the other hand, The Wall Street Journal stated that "it's nearly impossible to identify a clear ideological bent in the incoming president's" cabinet nominations. The Washington Post noted that Trump's cabinet would be "the wealthiest administration in modern American history." The Post also noted that while some of Trump's appointments consisted of "his staunchest and most controversial allies" such as Bannon, Flynn and Sessions, other appointments appealed to the Republican establishment and had "the imprint of Mike Pence". ^ Bernhardt served as Acting Secretary from January 2, 2019 to April 11, 2019. ^ Officially Mulvaney carries the title of "Acting White House Chief of Staff", but since the position does not require confirmation by the U.S. Senate, the title "acting" does not impact the authority of the position. ^ Haspel served as Acting Director from April 26, 2018 to May 21, 2018. ^ Wheeler served as Acting Administrator from July 9, 2018 to February 28, 2019. ^ Under President Obama, persons were restricted from resuming lobbying for two years after departing government; senior officials were restricted for the remainder of his administration. Obama also forb[ade] those who have been registered lobbyists in the past year from joining the administration to work on the issues they advocated around. ^ The Prime Minister of Japan is that nation's head of government. The Emperor of Japan is that country's de facto head of state. Also, neither was Mr. Trump a head of state at the moment. ^ Fang, Lee (November 8, 2016). "Donald Trump Recruits Corporate Lobbyists to Select His Future Administration". The Intercept. Retrieved November 15, 2016. ^ "The Presidential Transition". greatagain.gov. November 20, 2016. ^ "With only one possible winner, Trump and Clinton build White House transition team". Fox News. August 7, 2016. ^ Jackson, Herb (June 26, 2016). "Jackson: Transition teams get a head start on the White House". The Record (Bergen County). USA Today. Retrieved August 12, 2016. ^ "Trump transition tests outsider's governing ability". WAFF-TV. July 29, 2016. Archived from the original on July 30, 2016. Retrieved July 31, 2016. ^ Parker, Ashley (August 16, 2012). "Campaigning Aside, Team Plans a Romney Presidency". The New York Times. Retrieved January 22, 2016. ^ a b Fund, John (January 13, 2013). "What was Romney Planning?". National Review. Retrieved January 22, 2016. ^ a b Berman, Russell (March 1, 2016). "Congress Tells Obama to Start Planning His Departure". The Atlantic. Retrieved May 6, 2016. ^ "Help Wanted: 4,000 Presidential Appointees". Center for Presidential Transition. Partnership for Public Service. ^ "Academy Launches Presidential Transition 2016 Initiative". National Academy of Public Administration. Archived from the original on May 4, 2016. Retrieved May 6, 2016. ^ Davis, Julie Hirschfeld (April 20, 2016). "In an Age of Terror, an Early Start on the Presidential Transition". The New York Times. ISSN 0362-4331. Retrieved June 14, 2016. ^ Keane, Angela (May 6, 2016). "Trump Campaign Upends the Science of Presidential Transition". Bloomberg.com. Retrieved May 6, 2016. ^ Parker, Ashley (May 6, 2016). "Trump Asks Son-in-Law, Jared Kushner, to Plan for Transition Team". The New York Times. Retrieved May 9, 2016. ^ Watkins, Eli (May 6, 2016). "Report: Trump asks son-in-law to help prepare for White House transition". CNN. Retrieved May 6, 2016. ^ O'Donnell, Kelly (May 9, 2016). "Donald Trump Taps Chris Christie to Lead Transition Team". NBC News. Retrieved May 9, 2016. ^ "White House initiates transition planning with meetings, data transfers". Federal News Radio. June 6, 2016. Retrieved June 11, 2016. ^ Peoples, Steve (July 29, 2016). "Huge task of creating transition team will test Trump's ability to govern". Portland Press Herald. AP. Retrieved July 31, 2016. ^ Sherman, Jake (July 31, 2016). "EXCLUSIVE -- TRUMP starts building transition committee". Politico. Retrieved July 31, 2016. ^ Wheaton, Sarah (July 29, 2016). "White House talks transition with both campaigns". Politico. Retrieved July 31, 2016. ^ Rogin, Josh (August 3, 2016). "Top Corker aide joins Trump transition team". Washington Post. Retrieved August 10, 2016. ^ "With only one possible winner, Trump and Clinton build White House transition team". FOX News. August 7, 2016. Retrieved August 10, 2016. ^ Viebeck, Elsie (October 29, 2016). "White House meets with Clinton, Trump transition teams as election approaches". Washington Post. Retrieved October 28, 2016. ^ "Trump transition trying to raise $100,000". Politico. October 27, 2016. Retrieved October 29, 2016. ^ a b Foust, Jeff (October 27, 2016). "Election only the start of a long-term NASA transition". SpaceNews. Retrieved October 29, 2016. ^ "Highlights of Hillary Clinton's Concession Speech and President Obama's Remarks". The New York Times. November 9, 2016. Retrieved November 17, 2016. ^ Winter, Tom (November 9, 2016). "NYPD, Secret Service Upping Security at Trump Tower for President-Elect Donald Trump". WNBC-TV. Retrieved November 9, 2016. ^ "TRUMP TOWER SURROUNDED BY NEW, 'UNBELIEVABLE' SECURITY MEASURES". WABC-TV. November 9, 2016. Retrieved November 9, 2016. ^ "Trump Tower Is Now Heavily Fortified Behind Big Concrete Barriers". Gothamist. November 9, 2016. Archived from the original on November 12, 2016. Retrieved November 9, 2016. ^ "Trump's foreign business interests: 144 companies in 25 countries". CNN. Retrieved December 1, 2016. ^ Samuelsohn, Darren (November 10, 2016). "Trump's kids to run businesses via 'blind trust,' Trump attorney says". Politico. Retrieved November 17, 2016. ^ "Trump Organization planning 'immediate transfer' to kids, executives". Politico. November 11, 2016. Retrieved November 11, 2016. ^ Blake, Aaron (November 11, 2016). "Donald Trump's questionable 'blind trust' setup just got more questionable". Washington Post. Retrieved November 11, 2016. ^ McCaskill, Nolan D., "Highlights from Trump's press conference", Politico, January 11, 2017. Retrieved February 18, 2017. ^ "President Obama Delivers a Statement". youtube.com/thewhitehouse. The White House. Retrieved November 9, 2016. ^ "Secretary of Defense Ash Carter sends memo to staff demanding peaceful transition of power". The Week. November 9, 2016. Retrieved November 9, 2016. ^ "The Latest: FAA imposes restrictions over Trump Tower". WKOW-TV. November 9, 2016. Archived from the original on November 10, 2016. Retrieved November 9, 2016. ^ Acosta, Jim (November 15, 2016). "Trump receives first President's Daily Brief". CNN. Retrieved November 15, 2016. ^ "45". Politico. November 9, 2016. Retrieved November 9, 2016. ^ Scola, Nancy (November 15, 2016). "Trump transition website lifts passages from nonpartisan nonprofit". Politico. Retrieved November 15, 2016. ^ Trump Presidential transition (November 12, 2016), "Copyright Information - Copyright Notice", Greatagain.gov, retrieved November 12, 2016, Except where otherwise noted, content on this site is licensed under a Creative Commons Attribution 4.0 License. Content includes all materials posted by the Trump Presidential transition. Visitors to this website agree to grant a non-exclusive, irrevocable, royalty-free license to the rest of the world for their submissions to this website under the Creative Commons Attribution 4.0 License. ^ "What's Happening". whitehouse.gov. The White House. Retrieved November 10, 2016. ^ "Donald Trump open to amending Obamacare". CBS News. November 11, 2016. Retrieved November 11, 2016. ^ ISENSTADT, ALEX (November 18, 2016). "Inside Chris Christie's fall from grace". Politico. Retrieved November 19, 2016. ^ a b c d e f g h i j Arnsdorf, Isaac (November 11, 2016). "More lobbyists on the transition". Politico. Retrieved November 15, 2016. ^ a b Lipton, Eric (November 11, 2016). "Trump Campaigned Against Lobbyists, but Now They're on His Transition Team". The New York Times. ISSN 0362-4331. Retrieved November 15, 2016. ^ Arnsdorf, Isaac (November 16, 2016). "Trump team announces tough lobbying ban". Politico. Retrieved November 16, 2016. ^ ARNSDORF, ISAAC (November 18, 2016). "Lobbyists leave Trump transition team after new ethics rule". Politico. Retrieved November 18, 2016. ^ Jaffe, Alexandra (November 16, 2016). "Mike Pence Orders Lobbyists Be Removed From Transition Team". NBC News. Retrieved November 17, 2016. ^ Arnsdorf, Isaac (November 17, 2016). "Lobbyists scoff at Trump's five-year ban". Politico. Retrieved November 18, 2016. ^ "Trump requests security clearance for son-in-law Kushner". NBC News. Retrieved November 16, 2016. ^ a b Davis, Julie Hirschfeld (November 15, 2016). "Trump Staff Shake-Up Slows Transition to Near Halt". The New York Times. ISSN 0362-4331. Retrieved November 15, 2016. ^ "Readout of President-Elect Donald J. Trump's Meeting with U.S. Senator Jeff Sessions". GreatAgain.gov. November 17, 2016. Retrieved November 17, 2016. ^ "NYC Mayor Bill de Blasio on His Meeting with Trump". Voanews.com. Retrieved November 18, 2016. ^ "Readout of President-Elect Donald J. Trump's Meeting with Former Secretary Of State Henry Kissinger". GreatAgain.gov. November 17, 2016. Retrieved November 17, 2016. ^ Smith, David (November 17, 2016). "Shinzo Abe says Japan can have confidence in Donald Trump". The Guardian. Retrieved November 18, 2016. ^ Goldman, Russell (November 19, 2016). "5 Things to Know About Japan's Emperor and Imperial Family". The New York Times. Retrieved August 8, 2016. ^ Nakamura, Masanori (2016). The Japanese Monarchy, 1931-91. Routledge. pp. 33–34. ISBN 1315485915. ^ Lipton, Eric (November 18, 2016). "Ivanka Trump's Presence at Meeting With Japan's Leader Raises Questions". The New York Times. ^ "GOP Won With Accent On Rural and Traditional". Washington Post. November 4, 2004. ^ Faulders, Katherine (December 6, 2016). "Mike Flynn Jr. Forced Out of Trump Transition Amid Fake News Controversy". ABC News. Retrieved December 9, 2016. ^ Rosenberg, Matthew (December 6, 2016). "Trump Fires Senior Adviser's Son From Transition for Sharing Fake News". The New York Times. Retrieved December 9, 2016. ^ Streitfeld, David (December 14, 2016). "'I'm Here to Help,' Trump Tells Tech Executives at Meeting". The New York Times. ISSN 0362-4331. Retrieved December 15, 2016. ^ "Donald Trump let three of his children into a tech meeting but excluded Twitter for a ridiculous reason". The Independent. December 14, 2016. Retrieved December 15, 2016. ^ "This is how ridiculous the Trump tech meeting was". Business Insider. Retrieved December 15, 2016. ^ "Source: Twitter cut out of Trump tech meeting over failed emoji deal". POLITICO. Retrieved December 15, 2016. ^ Wohlsen, Davey Alba and Marcus. "Trump Is Meeting With Tech CEOs, and It's Gonna Be Awkward". WIRED. Retrieved December 15, 2016. ^ "Trump adds vice chairs to transition team, including several women". ^ a b Thrush, Glenn; Nelson, Louis (November 11, 2016). "Pence to take over Trump's transition effort from Christie". Politico. Retrieved November 12, 2016. ^ Greco, Jonathan (December 1, 2016). "Gov. Mary Fallin named vice chair of President-elect Trump's transition team". KOCO News. Retrieved December 10, 2016. ^ "Nominating Mnuchin for Treasury Will Dredge Up Mortgage Meltdown Controversies". Bloomberg.com/politics. November 22, 2016. Retrieved November 24, 2016. ^ Lecher, Colin (November 11, 2016). "Peter Thiel is joining Donald Trump's transition team". theverge.com. ^ News Documents (The New York Times). "Trump Transition Team List and Assignments". ^ a b Romm, Tony (November 9, 2016). "New details emerge on Trump transition organization". Politico. Retrieved November 12, 2016. ^ a b "Trump Campaigned Against Lobbyists, but Now They're on His Transition Team". The New York Times. November 11, 2016. ^ a b Romm, Tony (November 11, 2016). "New details emerge on Trump transition organization". Politico. Retrieved November 11, 2016. ^ Inc., Intelius,. "Andrew P Bremberg – Alexandria, VA – Intelius". intelius.com. ^ "Trump picks 'A-team' for healthcare transition as ACA repeal looms". modernhealthcare.com. ^ Reis, Patrick (November 11, 2016). "Top Trump immigration adviser joins transition team". Politico. Retrieved November 11, 2016. ^ McCarthy, Robert J. (December 15, 2016). "Langworthy named to Trump transition team". BuffaloNews.com. Retrieved April 14, 2019. ^ Borger, Julian (December 18, 2016). "White House faces exodus of foreign policy experts ahead of Trump's arrival" – via The Guardian. ^ Restuccia, Andrew; Cook, Nancy; Woellert, Lorraine (November 30, 2016). "Trump's Conservative Dream Team". Politico. Retrieved November 30, 2016. ^ Seib, Gerald (December 5, 2016). "Donald Trump Shuffles the Ideological Deck". The Wall Street Journal. Retrieved December 5, 2016. ^ Tankersley, Jim; Swanson, Ana (November 30, 2016). "Donald Trump is Assembling the Richest Administration in Modern American History". The Washington Post. Retrieved December 2, 2016. ^ Wagner, John; Sullivan, Sean (December 3, 2016). "Trump's Emerging Cabinet is Looking Less Trumpian than Expected". The Washington Post. Retrieved December 3, 2016. ^ Cook, Nancy (March 19, 2019). "Mulvaney on cusp of permanent status upgrade". Politico. Retrieved April 13, 2019. ^ "President Donald J. Trump Announces His Cabinet". whitehouse.gov. February 8, 2017. Retrieved February 9, 2017. ^ "Chart: The Status Of Trump Administration's Key Members". National Public Radio. February 2, 2017. Retrieved February 3, 2017. Wikimedia Commons has media related to Presidential transition of Donald Trump.